Juan Alindato García, a Puerto Rican artisan famous for his vejigante masks (traditional papier-mâché masks), died yesterday, May 28, 2010, at 90. Today he was taken from the Shalom Memorial Funeral Center to the Parque de Bombas Museum, then to church (Iglesia del Carmen), and from there was accompanied by vejigantes (masked and colorfully-costumed carnival figures) in a procession to the Playa de Ponce Cemetery. Born to Filipino parents on June 26, 1920 (or September 15, 1921) in Caja de Muertos, Alindato García may have been the last person known to have been born on this tiny island off Puerto Rico, according to his family. 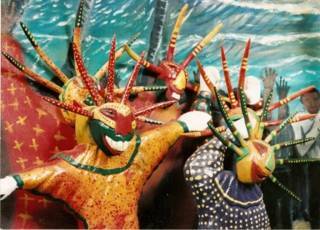 Alindato won numerous awards in his hometown, Ponce, for his exquisite carnival masks for the Ponce Carnival and the Vejigante Carnival of Playa de Ponce (a coastal neighborhood well-known for mask-making and preserving African-based traditions). In 2004 he was crowned King Momo of the Ponce Carnival Great Marshall [Gran Mariscal] of the Playa de Ponce Vejigante Carnival. His renown has also traveled beyond the shores of Ponce. In 1987 he won the National Artisan Award, when he was chosen as the best artisan among all those living in the United States and its territories. Among many other awards from universities, cultural centers, and other organizations, he also won the National Heritage Award from the National Endowment for the Arts (1987). In January 1991 National Geografic dedicated a spread to Alindato for his contribution to Latin American arts. His masks have been exhibited in throughout Puerto Rico, the United States, and Europe. I will like to know if you have a mask making program for a HS Group that will like to include this on thier trip to Puerto Rico. this is quite useful for my project!!!! I was Juanito’s neighbor and I used to help him make the horns for the masks in exchange for getting a customized one that I wore on Sunday afternoon during Carnival time. It was a pleasure knowing him and seeing the extent of his reach in the arts. Vejigante la bolla, pan y cebolla! Vejigante esta pintao, de amarillo y Colorao! !